Your life is busy, but with Green Wisdom you can learn anytime, anywhere! Our past and present students study from California to Canada to Croatia. Green Wisdom Online eCourses. Study natural medicine for personal self-care to professional clinical practice, even beginning your own natural medicine business. Receive individualized attention from instructor as you study or select a course option where you simply purchase the course module. Get your life on track with this 15-day easy to do self-care wellness program. Gigi Stafne MH, ND offers simple wisdom and effective tips for more healthful, soul nourishing living. Order this easy eCourse and get started with solo independent work from the comfort of home. ​Self-paced, solo work, no instructor. Are you an herbalism student, clinician or someone who wants to learn more about the important classification of herbs entitled, Adaptogens? This is a solid 2-hour class that includes a strong introduction about what Adaptogens are, a sampling of such herbs and fungi, along with 7 example clinical cases that you'll work on. This new course is an essential that will enhance your health and/or clinical practice. ​Self-study, send in no assignments, no need to take exam. Certificate is not received. ​Self-study, engage in assignments, send into instructor for input, take the exam. Course being updated, available again in March 2018! Establishing a New Natural Medicine Business or Enhancing an Existing Practice? Feeling passionate about creating your natural medicine business, but are overwhelmed and unsure where to begin? Or perhaps you wish to boost your present business to the next level of success. This Complementary Alternative Medicine Small Business Course is perfect for you. Whether you're in the dream phase or jump-starting your small business in an allied health field, this is a comprehensive course designed to transform your dreams and desires into an amazing and abundant practice! Those in massage therapy, herbalism, homeopathy, aromatherapy, personal coaching or other natural medicine and allied health professions. Instructor Gigi Stafne, ND, MH created this course with 28 years of experience behind her and thus identifying unique needs and gaps in CAM practitioners and business owners practices. This course is tailored specifically for those practicing in the unique profession of natural and medicine to help with common hurdles and barriers. Our online course can be accomplished from the comfort of your home or office. Work at your own pace and receive individual business coaching support online from the instructor. Each week you'll work on inspiring, practical assignments that directly translate to your practice in a real way. A big boost to your business! Ready to manifest your dream business right now? Make this valuable business investment in yourself. Certificate awarded upon completion of course. This small business course generally takes students 3 months to complete. All exercises apply directly to setting up your business. CAM Small Business Certificate awarded upon completion. From pregnancy to the elderly wisdom years there are unique herbs best aligned for each stage of life. Knowing which to use will help ensure greater happiness and health in life! This eCourse will help you select herbs for personal and family wellness. This course is also an excellent choice for health care and CAM clinicians who work with families. Course includes: Introduction plus informative units on: pregnancy and childbirth, childhood, 3 phases of women's lives, men's health, and the elderly wisdom years unit. Wrap up with an exercise on making it all real by creating your own home herb natural medicine cabinet. This 6-unit course generally takes 4-5 weeks to accomplish. Green Wisdom's eCourse students also have access to our educational ning site. Option 1118a is a certificate level course. Dabbled in herbalism, desiring to take the next step? Our inspiring beginner herbalism online course has been taught to students for 20+ years with fantastic success! Engage in foundational botanical medicine course that covers essentials that entry level students need to know, either for personal home health and wellness or to prepare for further professional studies within the natural or botanical medicine fields. Course is comprised of 10 core units. Generally students take 7-8 weeks to complete, although 6 months is allowed. Contemporary stress is nearly epidemic in our world. It impacts the physical, emotional, mental and spiritual well-being of many, from self to patients. Gain a solid understanding of what stress, distress and eustress are. Acquire clinical tools and skills to assist with coping and adaptation to stress from a mental health and natural medicine professional instructor. Learn about anti-stress foods, natural medicine and herbs for the Immune System, Nervous System and a special bonus assignment on Herbal Adaptogens. Enroll now and you'll be better equipped to help your clients and patients reduce stress in their lives immediately and significantly. Generally, this online course takes students 4-5 weeks to complete. Certificate level course, certificate awarded upon successful completion. Contemporary stress is running rampant globally. Everything from everyday stressors piling up to more complex situations where humans are impacted by accidents, crime, domestic violence, wars and life altering experiences. Intense emotional upset, trauma and PTSD--Post Traumatic Stress Disorder--can effectively be approached with clinically proven natural medicine modalities. Among such modalities is the subtle, yet powerful realm of Flower Essences. In this eCourse, students acquire knowledge and skills, for emotional upset to trauma. Flower Essences can then be utilized for personal wellness, family and patient overall health. Create an Emotional Care Kit at home as part of this course. Generally, this online course takes 2-4 weeks to complete. 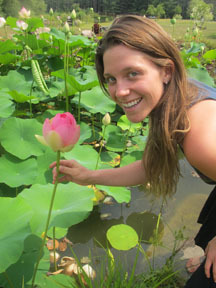 Instructor, Gigi Stafne MH, ND is one of the primary Trauma Trainers in North America and abroad for Herbalists Without Borders International. How do we best support individuals who have experienced intense life stress, trauma and major disruption? In this online course, learn to design a wellness plan that includes herbs and other natural supports that help ease the transition back to harmony and balance. This is a short certificate level course that will enhance one's personal life and augment your clinical practice. A strong finale to the two courses above. Contact our school for a special discount if enrolling in all three anti-stress courses during the months of January-February 2016. Consider our series of three eCourses above to acquire vital healing tools! Humanity needs you! Generally, this online course takes 2-3 months to complete. Certificate level course, certificate awarded upon completion. Save thousands of dollars in health care costs by acquiring important skills in our online classes! Easy option payment for eCourses: Visit our PayPal page, this website. List the courses you are registering and paying for via PayPal in their Memo line. #OL-VIP Enroll in 5 eCourses and receive "Health & Happiness, 15 Days, 15 Ways" for free!